A fuel-saving start-stop system is standard on the new Fiat 500 C.
TURIN -- Fiat announced Monday that the 500 C -- the convertible version of its popular 500 minicar -- will start at 16,600 euros in Italy. That is 2,800 euros more than the hardtop 500 with the same 1.2-liter gasoline engine and comparable equipment. The top-of-the-line 500 C, which offers a 1.4-liter 100hp engine and leather seats, starts at 20,800 euros. Fiat opened the order book today for the 500 C, which was unveiled in March at the Geneva auto show. Deliveries will begin next month. July is the 500s month. The original 500 was introduced in July 1957, in July 2007 we introduced the new 500 and next month the cabriolet version arrives, said Fiat Automobiles CEO Lorenzo Sistino in a statement. the Twingo minicar that it could begin selling in 2010, a company executive told Automotive News Europe last month. The 500 C is not a traditional convertible. Only the fabric roof panel folds toward the rear, similar to Fiat's original 500 models of the 1950s and '60s. The softtop, including its glass rear window, is electrically power. 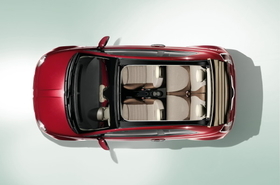 The convertible retains the same interior space for four occupants as the standard 500. The 500 C will be made in Fiat's Tychy, Poland, plant. The plant also builds the 500 hatchback, the Fiat Panda and the second-generation Ford Ka. A stop-start system is standard equipment on the 500 C with gasoline engines. Fiat says stop-start reduces the 500 Cs fuel consumption and emissions by 12 percent compared with a 500 without the technology. Adding the cabriolet to the lineup should help the 500 continue its strong sales. Fiat originally planned to make 120,000 500s a year but since it arrived 24 months ago Fiat has received 360,000 orders for the car from 59 markets, Sistino said.